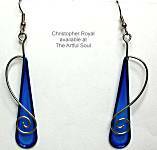 Christopher Royal's kinetic style jewelry, featherweight that will twist to show off it's movement, is made with stainless steel and resin-dipped colors. Contemporary with an architectural appeal, they are a wearable miniature version of his larger museum sculptures. Christopher's studio is in Chicago, where he also works on furniture and set designs for some rather famous outlets. 3-1/8 inches long including surgical earwire, 5/8 inches across, 5/8 inch deep. These will move to offer a different vantage point, in featherweight wearability. Stainless steel wire turned into a horizontal ring, has another wire dipped inside with elliptical drop. Amethyst purple and grass green, the color is clearer toward the center. 3-1/4 inches long including surgical earwire, 1 inches across, 1 inch deep. These will move to offer a different vantage point, in featherweight wearability. Stainless steel wire turned into a large horizontal ring, a teardrop suspended within its orbit. Aqua blue and lemon-lime yellow-green, the color is clearer toward the center. 3-1/8 inches long including surgical earwire, 5/8 inches across, 5/8 inch deep. These will move to offer a different vantage point, in featherweight wearability. Stainless steel wire turned into a horizontal ring, has another wire dipped inside with elliptical drop. Aqua blue and lemon-lime yellow-green, the color is clearer toward the center. 3 inches long including surgical earwire, 3/4 inches across, 3/4 inch deep. These will move to offer a different vantage point, in featherweight wearability. Stainless steel wire is turned and twisted to form the rings that are dipped in resin to capture transparent color, wire winds around a larger orb to circle to its moon. Cobalt blue and aqua, the color is clearer toward the center. 3 inches long including surgical earwire, 5/8 inches across. 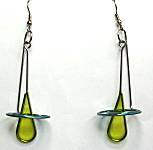 Stainless steel wire is turned and twisted to form the rings that are dipped in resin to capture transparent color, the simple elongated teardrop has a spiral atop it. Deep teal blue, the color is clearer toward the center. 2-3/4 inches long including surgical earwire, 1 inches across, 3/8 inch deep. These will move to offer a different vantage point, in featherweight wearability. Stainless steel wire is turned and twisted to form the rings that are dipped in resin to capture transparent color. Aqua and grass green, the color is clearer toward the center. Read about what others think of Christopher Royal jewelry! Instead of reviews for a specific product, this is a place to share about the designer line in general.